CRESTLINE — The Crestline Bulldogs winning streak ended Friday, thanks to Mid-Buckeye Conference rival Danville. The Blue Devils knocked off the Bulldogs 34-7 at Hutson Stadium. With the defeat, Crestline falls to .500 on the year at 3-3 and 0-1 in league play. Danville is now 3-3 overall and 1-0 in league play. Both Crestline and Danville only posted one score each going into halftime, 7-7. The Blue Devils then scored 27 unanswered points in the second half to rally to the 34-7 victory. The Bulldogs offense posted just 261 total yards against the Blue Devils defense on Friday, with the majority coming from the ground game. 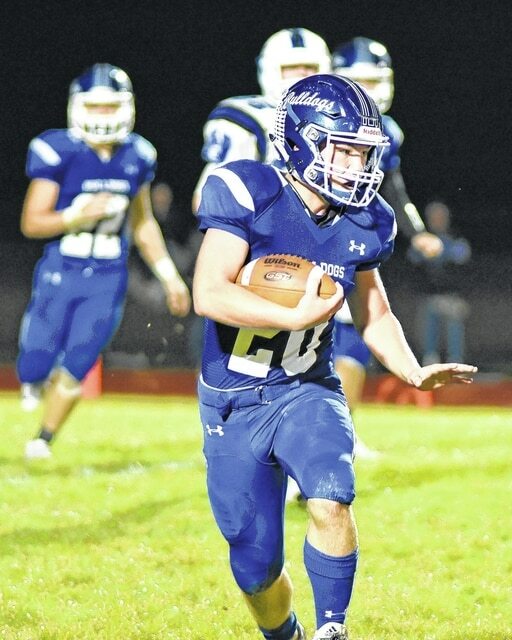 Crestline gained 153 yards rushing on the night, lead by Caleb Moore. Moore picked up 58 yards on just three carries. Also adding to that number were quarterback JR Wolfe, who picked up 46 yards on four carries and JC Clark with 46 yards on four carries as well. The only score on the night for the Bulldogs came through the air. Wolfe hooked up with Chandler Gaskill for a second quarter touchdown which, at that time, gave Crestline the lead. Wolfe was 10/22 passing on the night with just the one touchdown pass and two interceptions. Gaskill finished with four catches for 56 yards. The two other receivers that Wolfe found were Tyler Sipes and Ty Clark. Sipes had four catches for 36 yards and Clark grabbed two passes for 15 yards. Crestline will finish its season on a four-game road trip. This trip starts next week when the travel to Lucas for inner-league play against the Cubs. Lucas defeated Loudonville last Friday to improve to 5-1 overall and 1-0 in league matchups. Danville will be at home against Crooksville. Crestline quarterback J.R. Wolfe rifles a pass toward the sideline as his blockers hold off Danville’s Drew Printz at Hutson Stadium on Friday night. Photo by Don Tudor. http://aimmedianetwork.com/wp-content/uploads/sites/38/2016/09/web1_Crestline-FB-Sept.-29.jpgCrestline quarterback J.R. Wolfe rifles a pass toward the sideline as his blockers hold off Danville’s Drew Printz at Hutson Stadium on Friday night. Photo by Don Tudor. Crestline running back Caleb Moore turns the corner and picks up 51 yards against Danville on Friday night at Hutson Stadium. Photo by Don Tudor. http://aimmedianetwork.com/wp-content/uploads/sites/38/2016/09/web1_Crestline-FB-Sept.-29-2-.jpgCrestline running back Caleb Moore turns the corner and picks up 51 yards against Danville on Friday night at Hutson Stadium. Photo by Don Tudor.